Despite being painted as a gruff, implacable bully by partisans in the Senate, John Bolton was appointed Ambassador to the U.N. by Bush 43. I, for one, am thrilled. The United Nations issued no less than eight declarations condemning the Bordeaux stain on my white shag rug. Over three years the stains were in open contempt of the U.N. and did absolutely nothing to comply, often openly mocking the institution. Within one week John Bolton successfully negotiated an 88% reduction in coloration, thus saving the rug. And although the stain remained slightly visible, he also presided over mediation which led to the relocation of an ottoman so as to obscure the stain’s remnants. With Russia and China perpetually at odds with U.S. policy, the U.N. Security council dragged its feet for nearly an entire year on how to handle the wax drippings on my sofa. All proposals brought to the table were subject to the machinations of international politics and were threatened with a veto. John Bolton entered my home with a delegation equipped with the New York Post and an iron. The delegation placed the newspaper on the wax, heated it with the iron, and in doing so transferred the wax to the newspaper – rendering the sofa spotless. Ambassador Bolton then led his delegation out the door, rejecting any offers for juice. Despite the presence of U.N. peacekeepers in my shower, a steady and significant buildup of mildew took place beginning in 2004. By April of this year the situation was out of control. The peacekeepers, most of whom were from Bangladesh, were ill-equipped and had no mandate to remove mildew. They stood idly by and in short order were forced to pull out of my shower altogether. 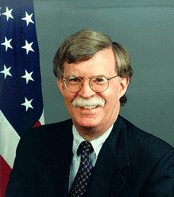 Three weeks ago John Bolton entered my shower and presented a document titled A Five Point Program for the Elimination of Mildew in Your Shower. Bypassing all the red tape, he put the shower on the fast-track to recovery and it’s been mildew-free ever since. He then offered to loofah my unreachables. I hope this gives pause to those who were quick to condemn Ambassador Bolton. Having experienced the man in action first hand I can tell you honestly that Mr. Bolton is surprisingly tough on stains yet remarkably gentle with a sponge. I know Senator Voinovitch (R-OH) has reconsidered his stance, so I can only hope that his Democratic opponents in the Senate will acknowledge this man’s remarkable stain-fighting abilities when he’s up for confirmation in 2007. We need to know there’s someone out there who’s not afraid to take action, especially after I pass out and get yogurt on the recliner.